We have a good news story we think you will enjoy. As you may know, we have lots of very talented higher education clients dotted around the world. So, when one of them wins not one, not two but five awards, it's only natural that we would want to shout it from the rooftops! 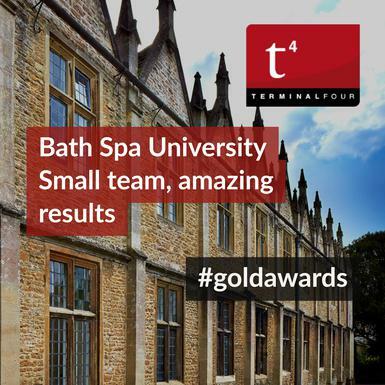 Last month, Bath Spa University announced that they had won five gold awards from two international digital award organisations. The AVA Digital Awards 2018 is an international competition that recognizes excellence by creative professionals responsible for the planning, concept, direction, design and production of digital communication. At this Awards, the Bath Spa website won gold in three categories; Educational Institution, Website Redesign, and Creativity - Web Design. 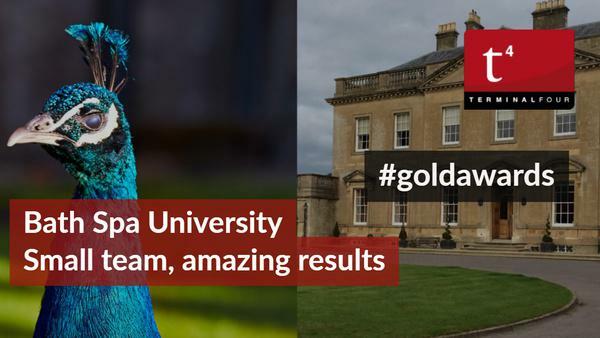 Bath Spa is the only higher education institution in the UK to have won one of these prestigious awards in 2018. Additionally, in the 2017 Horizon Interactive Awards, the Bath Spa website won two gold awards in the Websites - School/University and Websites - Responsive / Mobile Design categories. The Horizon Interactive Awards, receives thousands of entries from around the world every year, with an aim to recognize, promote, and award the best websites, videos, online advertising, print media and mobile applications. The University's new website project was managed by PJ Livingstone, Head of Web and Digital at Bath Spa University, and her team comprising of Eve Betts, Digital Content Producer; Rosie Maynard, Web Content Coordinator and Josh Ryall, Web and Social Media Coordinator, along with ourselves (TERMINALFOUR) and external partners The Roundhouse Digital, Funnelback and TINT. A website of this scale, really takes a village and it's a testament to the work-ethic of the team at Bath Spa University to have created a website of this magnitude. If you haven't had a chance to visit the website yet, make sure you do! It's visually stunning, featuring crisp photography, a clear non-cluttered side navigation and a simple search box on the homepage. Throughout the site, the content team has made incredible use of video, imagery and student testimonials. Students and prospective students are very much at the heart of this website and the user experience is built to reflect this. Well done Bath Spa University – it's a joy to work with you!